note to self for next time. I needed to have a cell have a yellow or red background colour based on its contents. I also needed a second cell to go yellow or red, depending on whether the first was yellow or red. The secret is conditional formatting and a new style. First make a new style. Set Cell Style to "redbackground"
Set Cell Style to "yellow background"
It seems that the logic stops as soon as it has a match, so you need to put the most restrictive first. 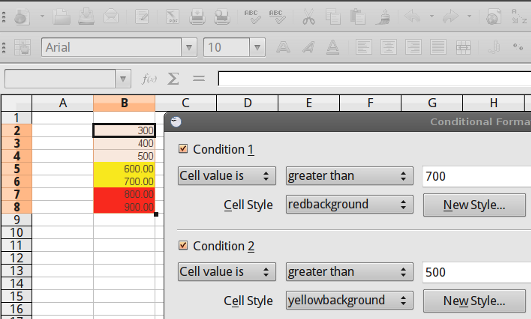 So for the next bit, we need to set the background colour of the cell depending on the value in another cell. 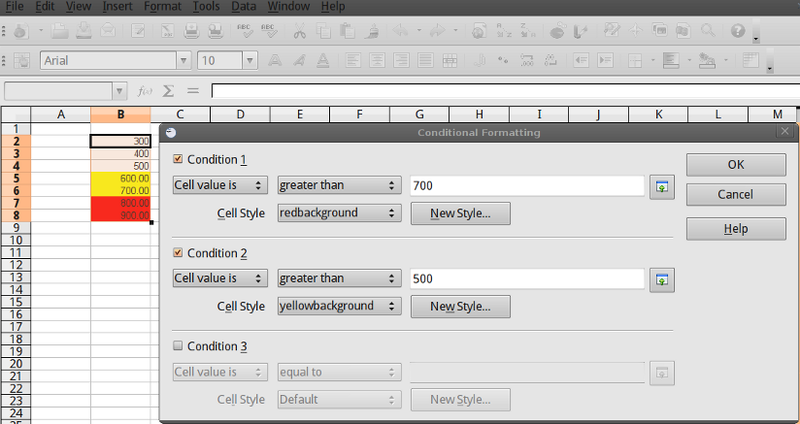 Under Condition 1, Change "Cell Value is" to "Formula is" "B2 > 700"
Select the Cell Style to be "redbackground"
Under Condition 2, Change "Cell Value is" to "Formula is" "B2 > 500"
Select the Cell Style to be "yellowbackground"